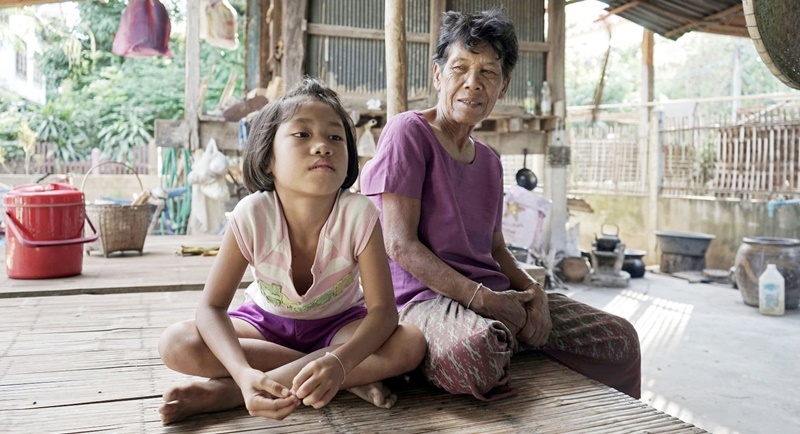 ISAAN: With a bit of luck eight-year-old Chayanit will see her mother twice this year. The little girl has been raised by her grandparents for most of her life after her mother left their rural village to find work in Bangkok, Thailand’s economic nucleus. A tide of internal migration has left three million Thai children growing up in similar circumstances and experts fear the phenomenon is incubating a social crisis. Grinning widely as she plays with a top knot in her hair, Chayanit says she is happy with village life in Thailand’s Isaan region. But the smile fades as the conversation turns to her family set-up, an arrangement shaped by economic realities in a rice-farming region where work is scare and wages low. “I like being with my grandparents, but I miss my mum. I can’t go to see her and she can only come here every six months,” she says. Her mother has an office job in Bangkok and sends back monthly remittances of around B3-4,000 ($85-110). Poor but populous Isaan has for decades seen its families split by migration. An estimated 30 per cent of the region’s under-18s are the children of migrant workers, most of whom leave for several years at a time, returning only for annual holidays. The exodus “has been normalised” by Thai society, explains Aree Jampaklay, of the Institute for Population and Social Research (IPSR), at Mahidol University, who has led pioneering studies on the issue in conjunction with UNICEF. But it is laden with risk. Their research indicates that Thai children living without their parents are prone to being poorly nourished, and suffer from developmental and behavioural issues. Those factors are particularly damaging in Isaan, where deprivation has been compounded by an ongoing drought. The region has several of Thailand’s poorest provinces and its schools already turn out some of its worst-performing students. And it has long been the epicentre of political opposition to the elites of Bangkok. Baan Dau in Ubon Ratchanthani province is much like any other Isaan village: the tallest building is an ornate Buddhist temple, chickens flit between yards while a tiny shop serves a close-knit community cocooned by rice fields. It is also nearly completely devoid of working age adults. Most have gone to Bangkok, a sprawling metropolis of some eight million that dwarfs all other Thai cities and where a taxi driver can make several times the monthly wage of a farmer. “Eighty, maybe 90 per cent of the households have grandparents raising the children,” says Chayanit’s grandmother Chanpen Uthachan, 70. Chanpen and her husband Prajak, also in his 70s, care for the girl and her five-year-old brother Kittipop. While there is no shortage of love, Chanpen says she has less energy than when she raised her own offspring. “It’s hard especially when they are sick and I have to stay up all night,” she laments. It’s not just home life that suffers. Local teachers say rural children without parents struggle to concentrate and as a result score lower in literacy and numeracy than their urban peers. Bangkok, which hoards Thailand’s wealth and political power, has for generations pulled in poor rural migrants. But the topic of what happens to the children left behind is not widely discussed. “The research is starting to show that this will affect the children’s future and therefore the future of the country,” explains Aree, the academic. Children aged between eight and 15 were significantly “less happy, less responsible and less confident” than those brought up by their parents. Worse still, infants’ language and social skills suffer. “Children are less exposed to activities that stimulate them such as reading, storytelling or games,” she said, explaining the rural elderly are often poorly educated themselves. In addition, the absence of breast-feeding and a poor awareness of a children’s dietary requirements also means many suffer stunted growth. The issue amounts to a poverty trap, explains Thomas Davin UNICEF’s Thailand representative, as migrants doggedly trying to remedy their situation end up undercutting their children’s lives. “The poor become poorer... the cycle of vulnerability repeats itself,” Davin adds. Boosting rural economic growth to encourage parents to stay and overhauling the country’s education system are among the long-term solutions, while UNICEF is also working with the government to give monthly support payments to poor families with young children. But policy implementation is rarely simple in Thailand, a country whose recent history is saturated with coups and political unrest. Policies involving Isaan are often highly charged. When they are allowed to vote, Isaan’s people do so for parties allied to billionaire ex-premier Thaksin Shinawatra, whom they laud for recognising their challenges and aspirations, but who is hated by the Bangkok-centric elite for his populist appeal. But it is the distance from his two young sons, not the politics of poverty, that preoccupy Assani Laocharoen, an Isaan migrant who works in Bangkok delivering furniture. Outside a squat, scruffy block of flats for migrant workers he says he can make it home only twice a year. “I miss my kids so much. I just want to live with them, hug, kiss and hang out with them,” he said.